School of the Woods and Montessori methods support students’ development in four major ways. The Mission Statement of School of the Woods says that the school integrates Montessori education with contemporary education methods to develop life-long learners who are competent, self-motivated, morally aware, and personally and socially responsible. Such people must also necessarily possess high self-esteem, and that is where our school and Montessori make a difference. Learning from one’s mistakes is universally viewed as a positive sign of growth. When people make a mistake, realize its consequences, and problem-solve a solution, they grow. A person’s self-concept is the greatest indicator of life-long success. This article will be presented in four parts over four issues of Inside the Woods. It is less a risk to repeat memorized facts and be assured a good grade than to take the risk of divergent thinking, which may not yield the “right” answer — the student thereby risking his good grade. The student is asked to learn the right answer and this product becomes the educational goal. 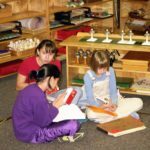 What is different in a Montessori classroom? It is that the emphasis is on process in the learning and the product or the answer is a secondary goal. In every learning sequence, students spend much time in process – the interaction with materials, trial and error, trying out their thoughts, finally discovering the rules on their own. After students have made the learning really theirs through process, then the product is emphasized. This is extremely important in today’s world where, it is said, 90% of what a child will need to know in his lifetime will be discovered in his lifetime. Thus, many of the answers or facts which are taught will be obsolete, and the process of learning how to learn will be the tool necessary for a successful life in the real world. Another avenue that encourages students to profit by their mistakes is the interaction of the teacher as a coach. According to philosopher/educator Mortimer Adler, coaching is the feedback that a teacher can give when the teacher/student ratio is small. For instance, a student writes a paragraph; the teacher proofs it with the student, giving the student feedback for corrections. This consistent, positive interaction leads the student to grow to a higher level of writing – the mistakes are the avenues of growth instead of a negative experience. In a Montessori classroom, the teacher/student ratio is low so that the teacher can coach the students. Dr. Montessori referred to the teacher as the directress, indicating that the goal is not to dispense knowledge or fill up an empty head, but to direct and coach students into their own knowledge. Students who have guidance in their learning and constant positive interaction from the teacher, at whatever their academic level, have positive self- esteem. This finding has been supported in previous testing of School of the Woods students – more than 90% felt that they “were good in their schoolwork” on the self-concept test. This perception of themselves held, regardless of their academic level. Research suggests that pro-social behavior is fostered in an atmosphere where students can interact with their peers without the teacher being the center of attention. Students learn from receiving the immediate feedback of peers, trying out alternate strategies, and solving problems on their own. This process can only happen in a classroom where students are allowed to talk during school hours, to work in large and small groups, to participate in peer teaching, to sit in different places in the room, and to solve their own problems. This classroom describes one that is student-centered versus one that is teacher- centered. The Montessori classroom is a student-centered environ-ment. To give and experience feedback in different social situations, there are large group meetings every day, many small group lessons, and individual work periods. Students move around the room each day, working next to different peers. This allows them to experience lots of feedback. The classrooms have multi-age spans, which encourages peer teaching. In receiving feedback, students are given the opportunity to experience the natural consequences of their behaviors. That is what encourages growth and being responsible for one’s actions. The teacher serves as a model and a guide for students to try out new behaviors. Responsibility is another social skill that is supported in the School of the Woods environment. When students break or damage something, they must either repair it or replace it by working after school to earn the money. Even accidents are handled this way, not as a punishment but to learn responsibility for one’s actions. This learning must take place in everyone’s life – better now than when behind the wheel of a car or in later life when the consequences are much greater. Students who feel control over their actions have a positive self-concept. School of the woods gives that opportunity to its students. How does testing and grading affect the self-concept of students? According to much research, once students are identified as “poor” students by graded tests, they find it very difficult to change their images. One of the reasons poor students have trouble changing their images is that the skills for which they received bad grades have never been remedied. In addition, students may be expected to move on to the next higher skill which can’t possibly be understood if the previous sequential skills have not been mastered. At School of the Woods, testing is viewed as a practical life skill needed in order to function in our world but not as an avenue to learning. The student is not “tested” to see if knowledge has been gained because the teacher has interacted with the student throughout the learning process and does not need that tool to evaluate progress. But, the ability to take tests is a skill that is taught throughout the elementary and middle school curriculum. Pacing yourself, looking for key words, checking all possible answers, strategy of when to answer, etc., are specific skills taught so that students will be able to function in the world. In the Montessori classroom, students master a specific skill before they move on, regardless of the timeframe required. There are no poor students, just students at many different levels. Recent research indicates that during brain growth, the right as well as the left side of the brain must be active in order for the nerve tracts to receive an optimal coating of myelin. (3) Whole brain activity must include manipulative materials with opportunities for divergent and creative thinking, leading a person into formal thinking. The Montessori curriculum encourages the use of manipulative materials and open-ended activities at all levels. Open-ended activities encourage the student to engage in analysis, syntheses, and evaluation, which are right-brain activities. Since the abstract, objective left-brain activities are not our only goal, students can spend their time and energy in a variety of whole-brain activities. Grading students by means of an A-F scale began when schools found it necessary to keep track of large numbers of students. Teachers did not have time to write personal notes about students’ progress. A grade in the form of percentages then began to replace the personal progress report. Soon, the reliability and validity of grades began to be questioned because there was a wide difference in scores among different teachers on the same set of papers and because the same teacher scoring papers at different times was inconsistent. This led to the one-right-answer objective test. With the use of the objective test came the decline of composition skills and critical thinking. This problem has yet to be solved, and the objective test is still in practice today. At School of the Woods, students are not given letter or number grades before the ninth grade. The teacher writes a personal report about each student. Conferences with parents about the student’s progress are scheduled at least three times during the school year. Sometimes the student is invited to participate. A personal conference gives much more information to both parents and student than a percentage score because it can address strengths and weaknesses and a plan for future action can be a part of the assessment. In addition to educating the whole child in the most imaginative and most productive way, Montessori education methods maximize the child’s concept of his self-worth. Assessment of the child’s progress discussed applies to grades through Middle School. Letter grades are given to Woods High School students to facilitate negotiations with colleges and universities. (1) Sizer, Theodore, Horace’s Compromise: The Dilemma of the American High School, 1984. (2) Bloom, Benjamin, The Taxonomy of Educational Objectives, 1956. (3) Myelin: a fatty protein forming a sheath around nerve fibers;myelin sheaths protect and insulate the nerve fiber and increase the rate of transmission of nerve impulses.